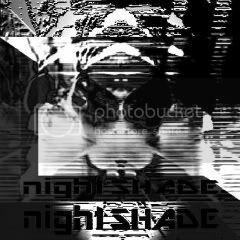 NightSHADE is kind of the ambient/noise outlet for the creative activities of British artist Jacob Price a.k.a. 0 a.k.a. SYNESTHESIA a.k.a. LEECHhead a.k.a. ☰. The self titled album provides 4 untitled pieces of tremoloid pulsating electronics.